it may take an extra day to complete an order that contains Rifle assemblies. Thank you in advance for your understanding and patience. They are worth the wait! 7mm tubes pre-cut to the length needed to make the 30.06 pen. We don't require a minimum purchase so we've priced them at each. This assembly has the cartridge, 7mm tube, adapter bushing, and tip pre-assembled. inside diameter of of a new or resized cartridge and the outside diameter of the 7mm tube. Press fit. No glue or solder required. Shown both turned/polished and raw. Blanks are square, 2" long. 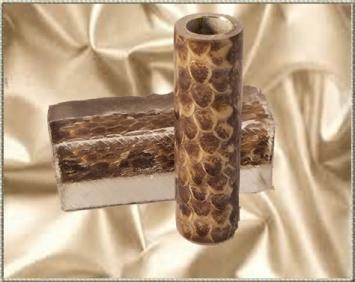 Blanks are cast in our Crystal Clear Polyester Resin on a Bolt Action Tube. These beauties are cast in our Crystal Clear Polyester Resin on a Bolt Action Tube. The number near the blank corresponds to the blank number in the drop-down menu. 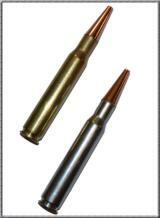 This is the powder coated version of our 50 Caliber Shell. These are spent cartridges that have been cleaned, tumbled,trimmed, polished and powder coated. This is the powder coated version of our Assembled 30.06 cartridge. This assembly has the cartridge, 7mm tube adapter bushing, and Tip pre-assembled. The default for the tip is Copper. If you would like another color tip, please put a note in the comment section of your order.